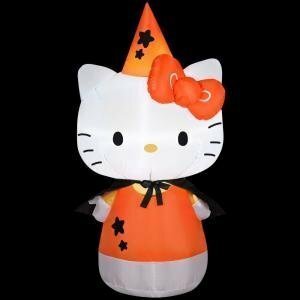 Host a spooky and fun Halloween celebration with Hello Kitty as your special guest. The Hello Kitty Halloween party would be a great theme for young fans or any girl who has not lost their love for this popular character. If your birthday is in October and you are planning a Halloween party to celebrate, you can add the Hello Kitty theme to the standard party. Or, if you are thinking of throwing a holiday party this year, why not pump it up a notch by inviting this cute kitty to be the guest of honor? This page will include everything you will need to complete your planning including personalized invitations, favors, birthday cake ideas, party supplies. games, custom birthday shirts, apparel and more. This theme is great for girls of all ages. 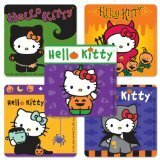 The Hello Kitty Halloween party invitation pictured below would be so cute for your holiday celebration. It features Hello Kitty in a pumpkin costume with bats, skulls, bones and an orange moon in the night sky. There are many other cute Halloween kitty designs to choose from. 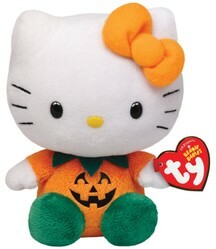 The Hello Kitty Halloween plush dolls featured here are so cute. One has Hello Kitty wearing an orange and black polka dot dress, orange hair bow and holding a pumpkin. The other has Hello Kitty dressed in black with orange and black polka dots and hot pink embellishments. Both of these would make a great Holiday decoration for your home. These fun bottle cap images would be great to decorate the invitations, thank you cards and favor bags. You could also use them to make your own Paper Cupcake Toppers for your Halloween party. Each set includes 30 different designs such as witches, bats, pumpkins, skeletons, dracula, mummies, zebra print, polka dots, stripes and much more. There are so many cute items available for your favor bags. The first items are buttons. These buttons feature many adorable kitty images including vampires, witches, skeletons, pumpkins, mummies and many more. You can also purchase jumbo sized stickers for the favors. The large square stickers measure 2.5". Other items include nail art and tattoos. The nail decal item pictured here features Hello Kitty flying on a witches broom and wearing a cute witches hat and cape. There is also officially licensed grosgrain ribbon you can use to embellish the favor bags. These cupcake rings would be perfect for your party treats. Each topper measures 1.5" and they come in packs of 12. Pumpkin carving kit containing tools and patterns. Have fun creating the featured Hello Kitty patterns. You can create a Halloween masterpiece with these great tools and kits. If you are hosting a Hello Kitty holiday party, these items would make a fun party activity. A celebration is always so much fun for kids when they can dress for their party theme. 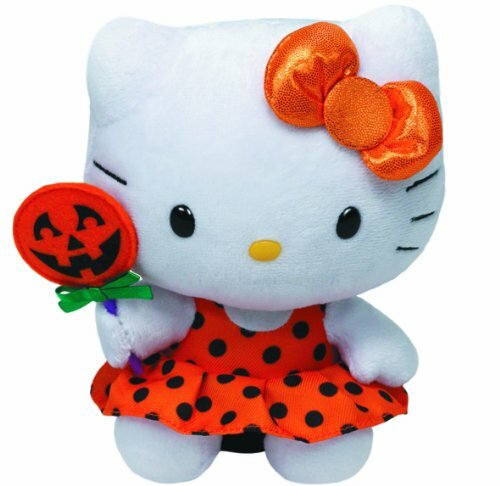 There are many items available for your Hello Kitty Halloween celebration. If you are crafty, you can purchase licensed grosgrain ribbon and/or fabric to make a dress, outfit or hair bow. The ribbon is available in many styles including zombies, devils, witches, pumpkins and scary vampires. There are many t-shirts on the market as well. The shirts feature sparkle, glitter and many creepy kitty images. Ebay offers a large selection of boutique apparel and accessories such as skirt sets, hair bows and outfits. 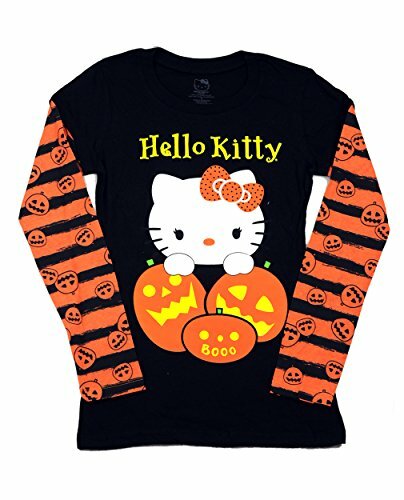 There are so many cute Hello Kitty Halloween shirts and outfits on the market for little girls, juniors and women. Some of the apparel includes long sleeved shirts, tee and scooter sets, mock layer t-shirts, short sleeved shirts, dress/tutus, short sleeved shirts, tutu with leggings and more. These clothing and apparel items would be perfect to wear to school, a Halloween party and with your Halloween costume. Nice selection. This should work for birthdays as well as Halloween.